If you’re looking for innovation with an eco theme then look no further. The Garden Village Resort, located not far from the stunning and world-famous Lake Bled, offers romance, adventure and exclusivity. Everything about the Garden Village Resort is unique – from the enchanted treehouses and rejuvenating spa treats on offer to the fantastic garden restaurant, where you can sit on natural grass in the shade of mighty trees while a stream flows between the tables. The accommodation is stylish and comfortable, the Village is exceptionally well thought out, and the natural surroundings are nothing short of sensational. Come and relax in this beautiful unspoilt part of the world. Bled is a picture-perfect destination which offers emerald-green waters, a mountain backdrop and a plethora of outdoor pursuits. Visit the tiny church on Bled Island (accessible only by boat) and the medieval Bled Castle, take a trip to the breathtaking Vintgar Gorge and and Triglav National Park, or delve into the mysterious underground caves of Babji zob. 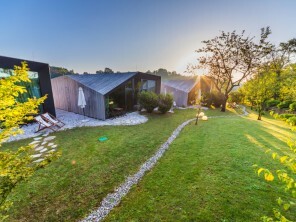 Alternatively take a day trip to nearby Lake Bohinj, the capital city Ljubljana, the famous Postojna Caveor the charming seaside town of Piran. And if you love fresh air and getting the adrenalin going then this is the perfect destination –you can go boating, rafting, canyoning, hiking, rock climbing, golfing, fishing, swimming, diving, paragliding, horse riding and mountain biking, to name but a few. The main airport Ljubljana is only 30 minutes away. 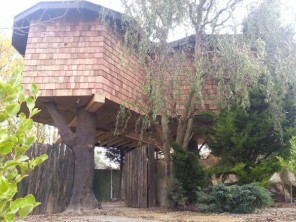 There are six delightful treehouses each of which sleeps four. Each treehouse has a small kitchenette, a minibar, a TV/internet, a sitting area and two bedrooms split over two levels. Each treehouse has a balcony lit by lanterns and a hammock for reading and relaxing. The treehouses are connected by a system of wooden and suspension bridges. The resort is exceptionally eco-friendly, with its own resource of electricity from photocells, a well with drinkable water, a heat pump for warmth, charging stations for electric vehicles and a greenhouse which produces fruit, vegetables and herbs. There is an organic shop on site which sells products from the greenhouse. 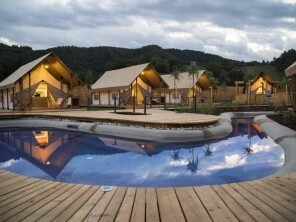 From 170€ - €290 per treehouse per night (treehouses sleep 2-4 each). PRICE INCLUDES: overnight stay with breakfast at the selected accommodation, free WiFi through out the resort, computer in the lobby, parking, baby cot, bed linen (change once a week when staying longer), 2 towels per person (change every three days) , 1x entrance to Finnish sauna (when staying min. 3 nights). SURCHARGE: Tourist tax: 1,27€ per day/adults, 0,64€ per day/ children 7-18 years old, Final cleaning: 20€ when renting a tree house, glamping tent or apartment/ 10€ when renting a pier tent, 5th person in the accommodation - 30€ per day, When staying less than 3 nights in low season- 20% surcharge, Entrance to Finnish sauna 45 min (2nd entrance or more) – 8€, extra towels - 2€ per piece, bathrobe – 5€ per piece.